Fridays gallery The outage occurred during a routine test of backup systems Saturday morning, Jennifer Wasmer, a spokeswoman for Xerox, which administers the program, said. By late Saturday, access had been restored. After the system failed, SNAP and WIC beneficiaries in the affected states were unable to buy food using electronic benefit transfers. Beneficiary access to programs such as SNAP, TANF, and other programs has been restored to the 17 States where Xerox provides EBT service. Re-starting the EBT system required time to ensure service was back at full functionality, Wasmer said in a statement. Courtney Rowe, a spokeswoman for the U.S. Department of Agriculture, told the Associated Press that the outage was not related to the government shutdown. Earlier Saturday, Brian Schleter, a spokesman for the Maryland Department of Human Resources, which provides services to low-income residents, confirmed the problems with the electronic benefits system. He said Maryland officials were in close communication with Xerox and were working to restore service as soon as possible. More than 6,000 Maryland residents received food assistance last month, according to state data. It was unclear how many residents in Maryland were unable to obtain food Saturday. Virginia officials could not be reached for comment Saturday. Before repairs were made, Wasmer suggested that beneficiaries work with their local retailers, who can activate an emergency voucher system where available. We appreciate our clients patience while we work through this outage as quickly as possible, she said. EBT cards are debit-type cards issued under the state’s food stamp program and coded to show the amount of money available for individuals to spend. Food stamps are a federal government subsidy program for low-income people that is administered by the states. RECOMMENDED: Food stamps: How does the program work? When word got out Saturday that the EBT cards were showing no limits, card holders rushed to area Walmarts to take advantage. “Some people had eight or 10 shopping carts full of groceries,”Springhill PoliceChiefWill Lyndsaid on Monday. Xerox said on Saturday that its systems that process EBT transactions suffered an outage stemming from routine testing of backup generators that malfunctioned.Louisianawas one of 17 states affected by the outage. Kayla Whiting, a spokeswoman atWal-Mart’s Bentonville,Arkansas, headquarters, pointed to Xerox as the source of the problem and referred further questions to Xerox. Xerox corporate spokesmanBill McKeeprovided a written company statement saying that Xerox has a “documented process for retailers likeWal-Martto follow in response to EBT outages.” But the statement left unclear who would cover the unauthorized spending, and it referred further questions toWalmart. Louisianaofficials said they had no intention of being left holding the bag. “The outage was the result of failures by our contractor, Xerox,” saidTrey Williams, a spokesman for theLouisianaDepartment of Children and Family Services. He said emergency procedures in place with Xerox allow retailers to call a phone number and receive authorization for purchases any time the EBT system is down. “Some retailers chose not to follow the process,” he said. “Those businesses are only being reimbursed for the (maximum) amounts on individual cards,” he said. Williams said that amounts transacted above the cards’ available balances were returned toWal-Martmarked “as insufficient funds.” He could not provide an estimate of the total amount of overspending or say who will cover it in the end. You might want to watch the city’s bustling food scene. Nashville has long lured musicians looking for a break, but lately the city has seen a rush of top notch chefs and restaurateurs, too. And it’s largely thanks to those same musicians. “Not only did the music (industry) bring money, stable money, into this town, it also brought people, people from all over the country and the world, to live in Nashville,” says Roderick Bailey, who recently was named the Southeast’s best new chef by Food & Wine magazine. Those people brought worldly palates. And an expectation that those palates could be catered to. The Kings of Leon, for example. Band bassist Matthew Followill says the band’s constant touring exposed its members to all manner of great food. And they wanted it when they came home to Nashville. “A lot of the people in the food industry are also big music fans,” Followill said at the band’s Nashville studio. “We kind of felt like Nashville didn’t have a really good food scene going on. And it has changed for sure, in the past three, four, five years and there have been a lot of great restaurants that have come in. But for a while it was kind of lacking in that area compared to some of the other cities on the same scale.” That’s changing. Fast. Last year alone nearly 75 new restaurants opened. “Getting paid helps, but it doesn’t help right now,” said one, who acknowledged she’ll probably get paid once the shutdown ends. Still, the woman said she is struggling to put food on the table. Some told CNN they were living paycheck to paycheck. “The biggest thing (people are feeling) is fear,” said Hahn. “Even a lot of federal employees who know that they’re going to get their checks made up, they’re still going to be shy” if they miss a couple of pay periods. President Barack Obama visited a food pantry in downtown Washington on Monday where he helped make peanut butter sandwiches. 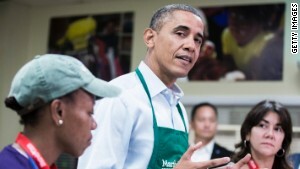 He told reporters that he stopped by Martha’s Table because many of volunteers there had been furloughed. “They’re here contributing and giving back to the community and I think that shows the kind of spirit that we have among all kinds of federal workers all across the country, people who dedicate their lives to public service,” Obama said. Hahn, who has worked for Chesapeake Church for 20 years, said many of the men and women he saw collect food on Monday were new faces who had never sought their help in the past. While a study by Main Street showed that Calvert County was the 13th wealthiest county in the United States in 2012, Hahn said that ranking doesn’t show how many “working poor” live in the area. “It’s a damn shame,” Maryland Gov. Martin O’Malley told CNN. “It’s no fault of their own, but they find themselves now in a position of, of having to come here for help.” O’Malley, who attended the event, said he would recommend that “those who for ideological reasons feel shutting down our government is a good idea” should “come here and see the families that are showing up for help to feed their families for the first time in their lives.” As volunteers passed out food, there was obvious frustration with political leaders in Washington. Those in line lamented the fact they were expected to just go without pay. Hahn said he had more important things to do than worry about how things will shake out on Capitol Hill.